David Mitchell admitted to wanting to build “my own Middle Earth” while discussing the shared universe he’s created for his novels on Saturday night at the Edinburgh International Book Festival. 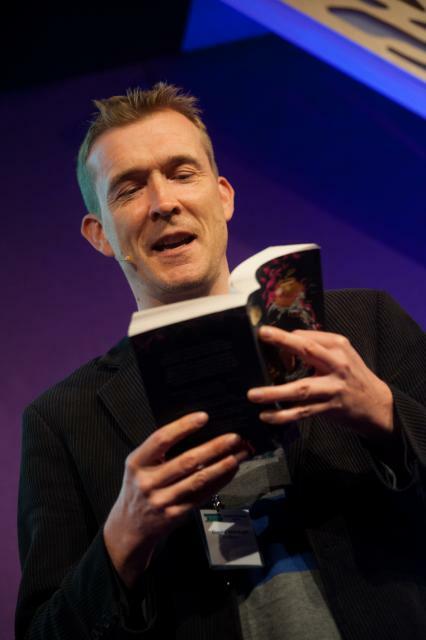 The event had the cautious title of Transports of Fictional Delight, which sounds like a tortured attempt to circumlocute science fictional implications, but as Mitchell himself said whilst discussing his latest novel, The Bone Clocks, he sees genres as a set of tools to be used in whatever way is most appropriate. Nowhere is this more apparent in his writing than in the structure of The Bone Clocks, which experiments with 6 different genres across its 6 distinct sections, tying different writing styles to different stages of human life. During an engaging and entertaining talk, Mitchell also spoke of the need to ‘tether’ his beloved fantastical elements to reality, often using a grounded system of ethics which he explores through different factions of protagonists. He also touched upon the difficulties of writing good female characters, and described his method of seeking out bad examples in literature and then avoiding the mistakes those authors had made. Prompted by a question from an audience member about the future of fiction in the age of social media, he said that he believes narrative is eternal, and will always adapt to new technological paradigms. He will remain, he said, “a servant of the book”, and he continues to believe in the power of fiction to make political statements, particularly about ever more pressing environmental concerns. To finish, Mitchell gave a brief reading from his new book, Slade House, due to be published in October. The work is, according to the event’s chair Stuart Kelly, Mitchell’s darkest yet, and forms a sequel of sorts to The Bone Clocks, further expanding the author’s fictional universe. A bleak mixture of twisted fantasy and gritty realism, it looks set to showcase once again his talent for telling fantastical stories with a powerful emotional core.